You can enter on this website as soon as Entries Open on 1 April 2019. Entries will close 20 May 2019. (You will be able to start your entry, and then you can come back to as many times and you like it using save). Entry is open to any carpentry apprentice, regardless of their training provider i.e. you don't have to be a BCITO apprentice. Check out our quick entry guide here and read all about entering here. Follow us on Facebook and Instagram for alerts regarding entries opening and closing and more! WHO IS ELIGIBLE TO ENTER IN 2019? Currently employed by, or contracted to a building firm or a builder at the time of the regional competition being judged. Project Details section - this is where you submit details of a project you are currently working on or have completed while you were training (you can upload online or post to your local RMBA Regional Branch Manager in hard copy). There are two examples below. Declaration section - just a tick in a box from you! And that's it, you can kick back and relax until entries close on 20th May 2019. You can view samples of the Entry Form and answers from winning apprentices below. Consult our tips for apprentices to ready yourself in case you make the cut: After entries close we'll be in touch to arrange the next stage of the competition, which - is a 2 hour practical challenge. If you'd like to see some winning examples of the building project section of the entry then just click on the links below. Corbin Mills - RMBA CARTERS 2018 Apprentice of the Year 2nd place winner in the national competiton, and Regional winner in the Central North Island. Peter Ravn - RMBA CARTERS 2018 Apprentice of the Year National Winner and winner of the Central South Island Region. how is your entry judged? From here the judging process begins, and is made up of the following stages. It all starts here - points are allocated for the quality of your initial entry, so take your time with it. Get your entry finished before 20th May 2019. Complete a two hour practical challenge at selected CARTERS in your local area on Saturday 22 June. The locations will be decided based on entrant numbers in the area. *Details will be forwarded to all entrants in the week of 11 June by the regional branch AOY coordinator. Apprentices MUST report to their designated CARTERS store on time or will be out of the competition so we recommend you arrive early. From all the entries in Stage 1, a maximum of ten will be shortlisted to progress to Stage 2 of the competition which will include an interview and a site visit. The judging panel is made up of a regional representative from Registered Master Builders, BCITO and CARTERS. This may be carried out the same day as the site visit or an alternative date which will be confirmed with you. Entrants will be visited onsite by the judging panel to discuss the project and their personal contribution to it. It is to your advantage to link your site visit to your submission - complete builds are fine. Also note your tool kit will be assessed at the site visits and contribute towards your points. Regional winners and placegetters are announced at award events in your region during August and September. The 10 regional winners then compete for the Registered Master Builders Apprentice of the Year in Association with CARTERS - title. 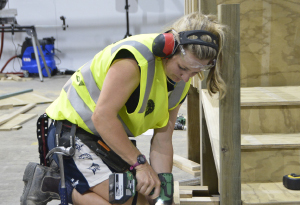 National judging takes place over two days on 7-8 November 2019 and includes a 45-minute interview with the national judging panel and a practical skills test at Build Auckland (trade show). We will pay for all your transport there. The practical skills test is open to the public on the morning of Friday 8th November at ASB Showgrounds. National Judging and Awards are held in Auckland on 7-8th November 2019. This two day event comprises interviews and the practical building challenge open from 9.30-1pm followed by the National Awards Gala dinner 6.30pm (Ticket only). (These dates/venues are subject to change based on entry numbers, please check closer to the time for confirmation).